Cells: Size 18650, 3.6V, 2.2Ah (nominal). Arrangement: 6831 cells, size 18650, in 11 sheets. Each sheet contains 69 parallel strings and provides 32.4V (nominal). Each string contains 9 cells in series. 10 of the sheets provide traction power, the 11th layer provides accessory power. 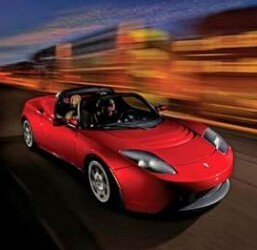 On the EPA highway cycle, the Roadster's efficiency is "135 mpg equivalent, per the conversion rate used by the EPA" which converts to 133 Wh/km (4.66 mi/kWh) battery-to-wheel or 155 Wh/km (4.00 mi/kWh) station-to-wheel. Tesla also reported the battery-to-wheel efficiency as 110 Wh/km (5.65 mi/kWh) on an unspecified driving cycle (either a constant 60 mph (96 km/h) or SAE J1634 test) and states a charging efficiency of 86%. This results in an overall station-to-wheel efficiency of 128 Wh/km (4.85 mi/kWh). The Roadster's engine efficiency is 90% on average and 80% at peak power. For comparison, an internal combustion engine produces 6000 to 9000 Wh of output energy from each gallon of gasoline input. The state of tune and seasonal variations in gasoline formulation account for the output range.